Heat the oil in a small saucepan. Roughly chop the lemon grass, chilli and garlic; add to the saucepan and cook until the onion is soft. Next add the curry and tamarind pastes, coconut milk, peanut butter and sugar and gently bring to the boil. The sauce should be nicely thickened. 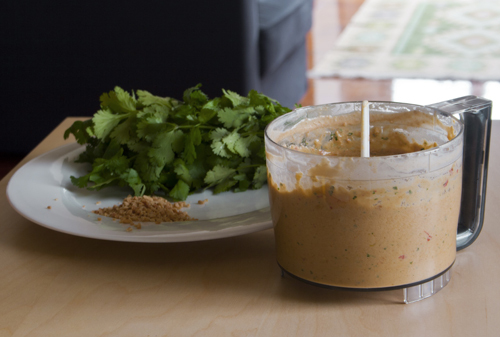 Allow this mixture to cool and transfer to a food processor with the peanuts and the coriander. Blitz everything together until you get a fairly smooth paste. 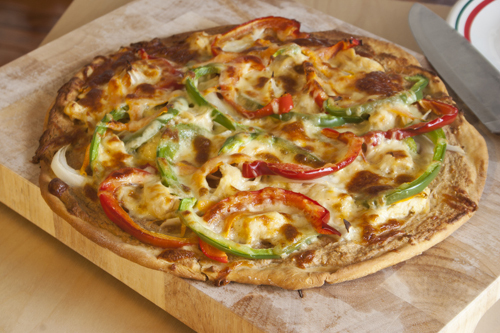 Recipe is adapted from quick and easy pizzas and pasta from Trident Press International. Place the yeast, sugar and the water into a bowl (it helps if the bowl has been warmed a little). Mix to dissolve and set aside for about 10 minutes until it is frothy and foamy. Meanwhile sift the flour and salt into a large bowl. When the yeast is ready, mix in the oil (it won’t mix in very well, but don’t worry). Next, add this to the flour and mix well, the dough will start to come together in a minute or too (alternatively you could do this in a food processor). Turn the dough out onto a clean, floured surface and kneed for about 5 minutes until it’s all the same consistency and is nice and elastic. Add more flour if you need too. Then, pop the dough back into the mixing bowl, cover and leave in a warm, non-draughty place for about 2 hours or until it has doubled in size. Once the dough has risen, put it back onto the floured surface; knock it back and kneed for a further 5 minutes. Then roll it out into whatever shape you want your pizza to be, I made two round pizzas that were about 30 cm across. 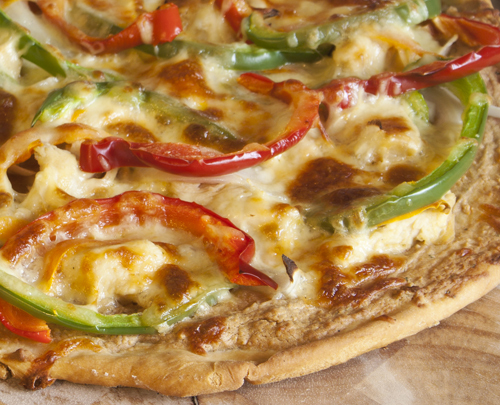 Spread the satay sauce generously across your pizza base. Sprinkle the peppers, onion and chicken evenly across the pizza. Top with the mozzarella and bake for about 25-35 minutes or until they are nice and golden brown and crispy on top. Wear loose fitting pants, promise yourself you’ll go out for a run tomorrow (or maybe on Monday), slice up and enjoy.